A cocktail of 100 % natural ingredients, preservatives free. The massage blend will facilitate body metabolism, will improve the lymphatic drainage and skin tonus. The Juniper, Fennel and Rosemary essential oils help to regulate body liquid balance and have a proven tightening effect, thus often used to fight cellulite, varicose veins and stretch marks on the skin. The Patchouli oil has a skin lifting effect by rapidly fixing the loose skin after dieting and helps its rejuvenation; it stimulates the new cell regeneration and visibly reduces skin scars. The Lemongrass oil restores skin tissues, removes skin toxins; improves skin elasticity and retains skin moisture. 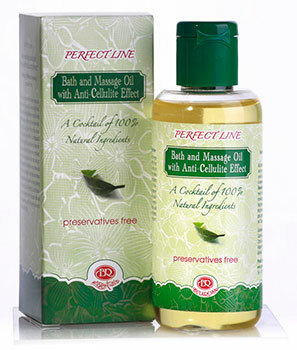 The almond oil is easily absorbed, soothing, softening and smoothing the skin. The everyday use of the massage blend will visibly reduce the fatty depots, soothe and improve the “orange peel” skin structure, increase it tightness and elasticity.